New VR headsets grab fewer headlines as products proliferate, that is only natural. This year we have already seen some new hardware from the current biggest players in the field, Facebook (Oculus) and HTC Vive. However, it is good to see a strong new entrant, from PC games goliath Valve, which previously put its weight behind HTC's products. At the weekend Valve uploaded a single page teaser for its upcoming virtual reality headset. The device is dubbed the 'Valve Index', and the web page includes a dark image of the unit from underneath (see below). 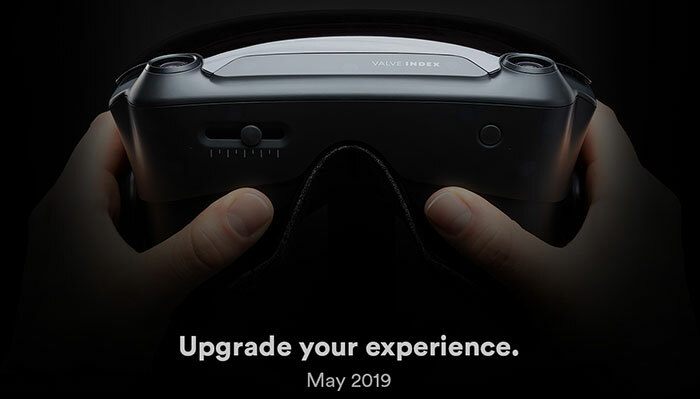 Elsewhere on the page is the slogan "Upgrade your experience," accompanied by the broad date - May 2019. Virtual Reality speciaist site VR Focus shares some useful background information and rumours regarding the Valve Index. From its analysis of the picture it says that the graduated slider on the rear left of the unit is an IPD (interpupillary distance) adjustment slider. The cameras you can see protruding from what would be the front of the HMD, as worn, are expected to be "for inside-out tracking similar to Windows Mixed Reality (WMR) headsets, but the image does show faint circles which could also be for outside-in like the HTC Vive," according to VR Focus. Other possibilities are that the cameras could be used for passthrough video (AR style), or hand tracking. It is expected that the Valve Index will be a tethered device, connected to your PC as per Valve's forte. With the Facebook Developers Conference (F8) scheduled for 30th April to 1st May, it would be natural for Oculus to launch the Rift S and Quest HMDs, and Valve could steal some of this thunder by announcing details of its Index at around the same time.